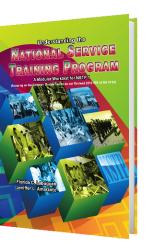 This reference text is a result of a long search for the appropriate materials for the Civic Welfare Training Service (CWTS). 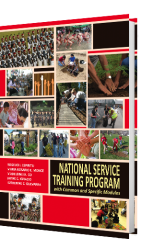 One of the principal aims of the NSTP is to instill in the minds of the young Filipinos the culture of volunteerism. But developing a high sense of volunteerism is not enough to make the young citizens become effective agents of development. In order to become an effective community worker, each student of CWTS must possess not only the ability to identify the problems of a community. He must also exhibit the ability to understand causes and effects of those problems which will provide great help in formulating the kind of intervention needed to confront them. The task of student community workers is not easy, especially on the part of those still in the process of gaining accurate perspective of the dynamics of the community. Each community is characterized by various complexities of sociocultural realities. That is indeed the reason why the authors believe that there can never be one written material capable of providing complete answers to the issues of even one community. But even so, this reference text hopes to share relevant information that will encourage young individuals to become empowered members of the society to which they belong. Empowerment would mean being always ready to initiate actions instead of just being plain participants in any community building efforts.